I assumed that chocolate and sweets would be the hardest for me to give up. But they were easier to skip than I thought! What was difficult to give up, though, were cheese and tomatoes. For some reason all I wanted to do was add cheese and/or tomatoes to everything, or eat something cheese/tomato related: tomato soup, grilled cheese, spaghetti with marinara sauce, pizza, the list goes on. To make matters worse, my mom made lasagna for dinner on Tuesday night, so I had to watch my family eat exactly what I had been craving, right in front of me, while I couldn’t have a bite. But you know what? I made it! I watched them eat the delicious lasagna and never had a bite. So I guess this detox has also been good for my willpower. Yesterday I was hungry for a snack, so I made some kale chips. 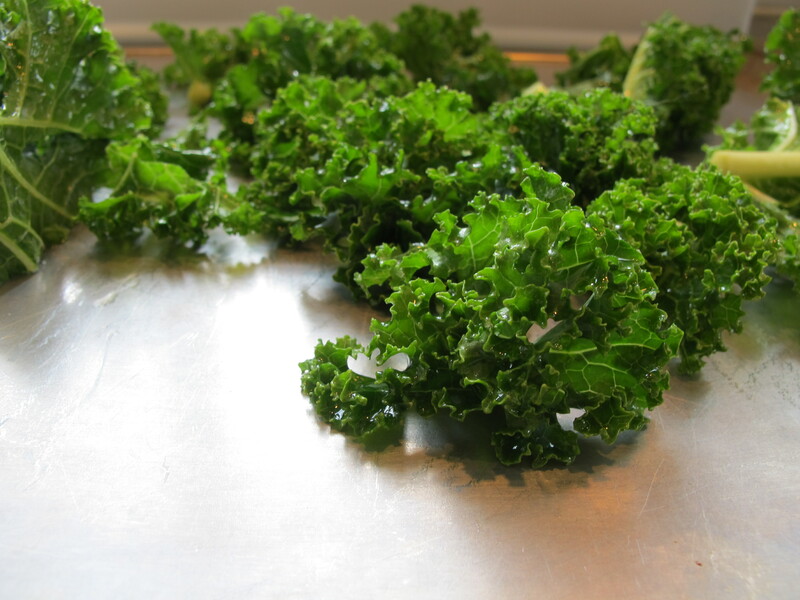 Kale chips are pretty healthy and very easy to make, so I thought I would share the recipe. 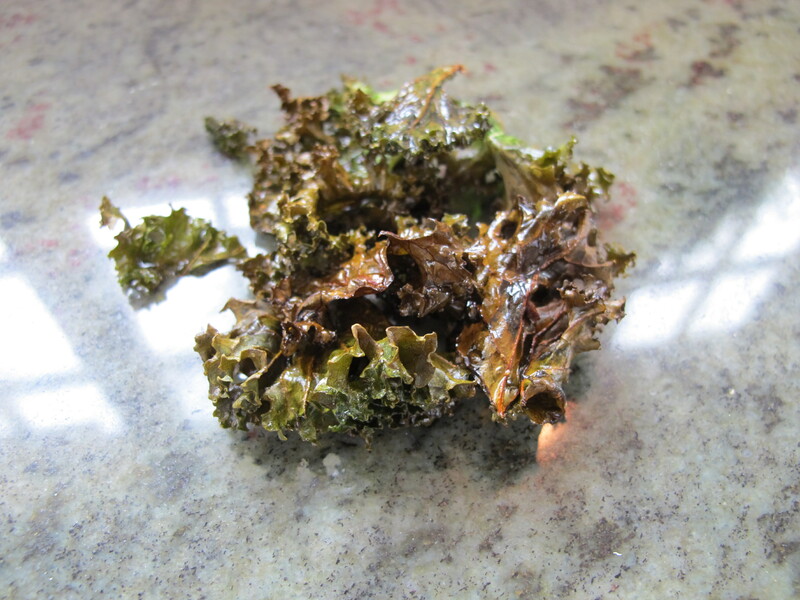 I think the best way to enjoy kale chips is to not think of them as a potato chip substitute — they will never compare. But as a healthy, salty snack, they’re pretty awesome. Break the kale leaves up into small pieces, and put them in a bowl. Add a little bit of salt, and then enough olive oil to coat all of the kale leaves. Mix everything up so that the kale leaves have a thin coat of olive oil on them. 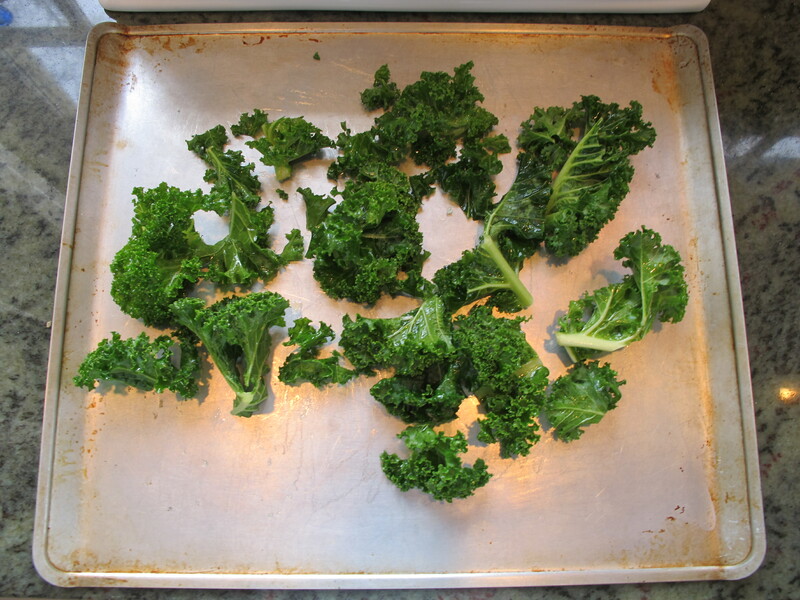 Spread the kale pieces out on a baking sheet, and place in the oven for about 5-10 minutes. Cooking time will vary depending on how big the kale pieces are, but I suggest checking them after 5 minutes and keeping an eye on them. Once you take them out, let them cool for a minute, and then you can snack! This entry was posted in Noms and tagged detox, kale, kale chips, snack. Bookmark the permalink.